Darski I am just so tickled that you were able to crochet and it really looks like a fair amount. Its a lovely set as usual. Glad you made it back online. Maybe it was one of those wonderful updates. My sis got one about a week ago that caused mega problems. I worry when our friends here go missing for very long. Denise hope you have recovered from your bouts of pneumonia. Sorry for the loss of your aunt. I am off to a slow start as I have been catching up on potholder requests from family. I am in the planning stages on some things like a doll blanket, bag and maybe toy food for Chris, lapghan and mini stockings for Warmth for Warriors, scarves and hats for Pine Ridge Reservation. Well,the end result is very cute! I might be able to do the simple pieces like the blanket and hat, I need to break out of my crummy old hats and wash cloth comfort zone. i should probably find a doll for testing. I know Anerican Girl is the standard but I'm going to take a hard look at sales before I decide. Would another brand who is the same would work. I'll have to scroll back and see the other dolls and places that you all get them so I could have a model to try. Can Darski or someone lead me to a "you can't fail" pattern for the same doll? I'm game to try something new! Hi, everyone! Bailey mentioned she was on here and I thought I'd check it out. 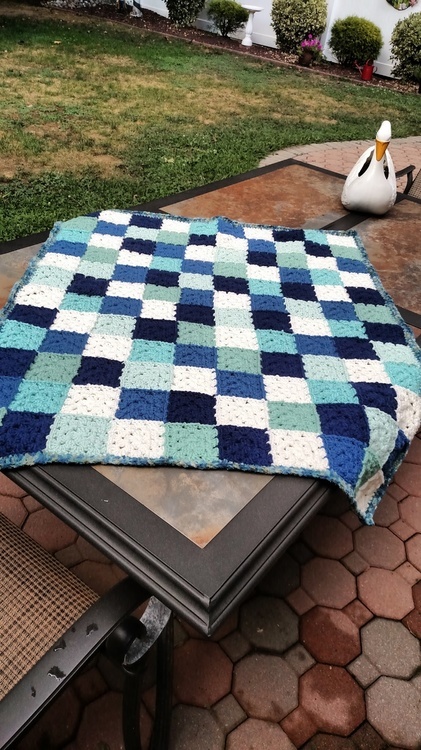 I crochet for a friend's NICU, where she's a nurse. Welcome. Sometimes the best projects come through people we know. Hi Judy, welcome! We are pretty informal here. We'd love to hear about (and see) any of your charity projects! 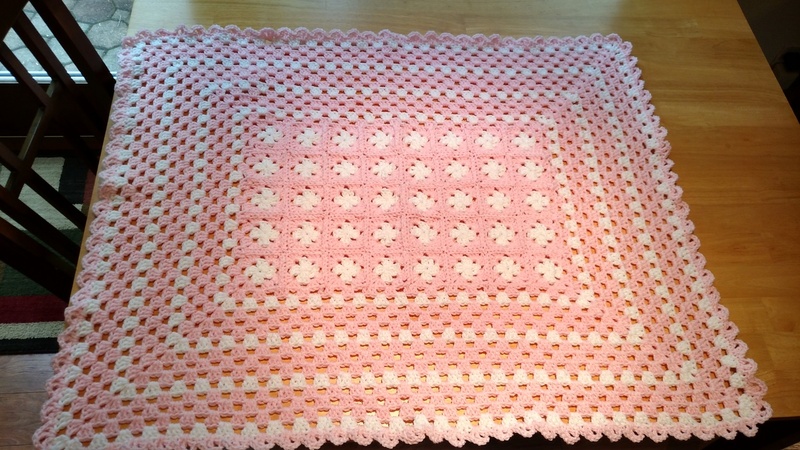 Here's an example of what I like to make for the NICU. They don't always get preemies, as my friend has said, so bigger blankets are welcome, too. I sometimes make beanies, too - but not too often. Judy, those are beautiful. If you turned your back and I has 2 seconds to run off with one, I think it would be the blue star. You'll have to find the link here Darski because I think I got it off your Yahoo group years ago, but your Pilgrim girl is the easiest dress pattern and I've used it so many times for so many different kinds of outfits. I LOVE that pattern. When I can't make anything work that dress always comes out. Found it. Thanks for those ideas. I was able to download the PDF of Youthful Memories to my iPad. It usually doesn't cooperate with me. Darski, I love that you show a close up of each piece with the pattern. I do crochet tightly, so this will be an interesting attempt. 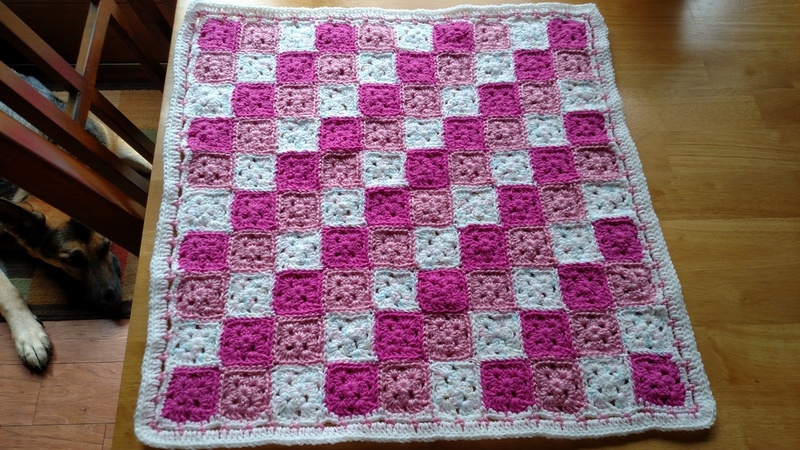 A gal at work is having a baby and I am going to try a new pattern that starts with "chain 99". I never can get a chain count that high right. I think that is why I do so many hats. They start small and grow. So this will also be a good test. 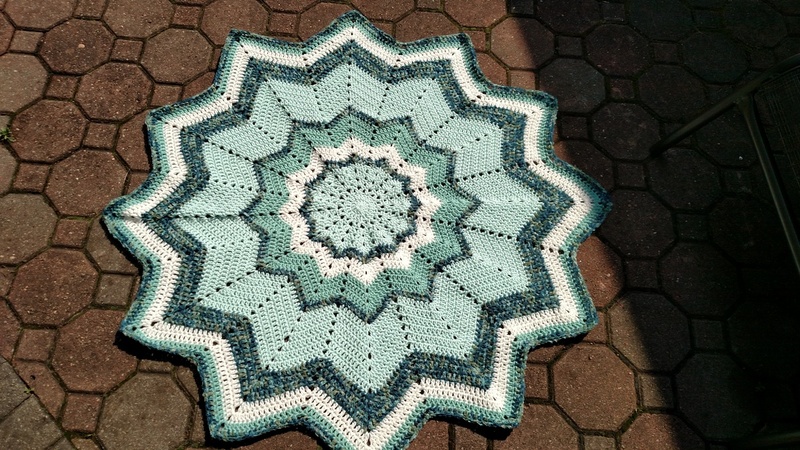 I could do a star pattern but since my first one was such a disaster, I'm not sure I am ready to try another one yet!! I have to mark every 10 in order to count that high. It just becomes impossible for me to get a correct count otherwise. Beautiful! I love the shade of pink you used! New yarn alert! After a long week at work (48.5 hours) and three nights of volunteering...I treated myself to a Caron Chunky Cake. It's very soft. I had a coupon so it was $6 instead of $10. I will probably make a hat just to try it out. I haven't done much yarn related charity work so far this year, but have been sewing for the rescue, so a hat would be a nice pick-me-up before I try the baby afghan or the tiny doll project. I have never worked through one of these skeins. I just purchased some at a discount type store( between dollar store and Walmart. I discovered that they got the different colours by just tying colours together. is this usual for this stuff ? People asked me before about simple projects for the 18" dolls I forgot to mention for those of you who loom knit, the blue knifty knitter fits the 18" doll for hats. I've made a few over the years and they are rather cute for winter wear. Thank you! 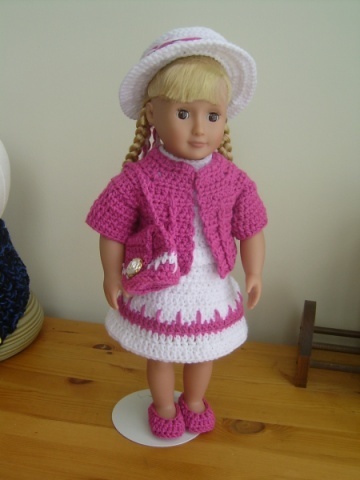 I dont have dolls to try clothes on but I do have the looms. 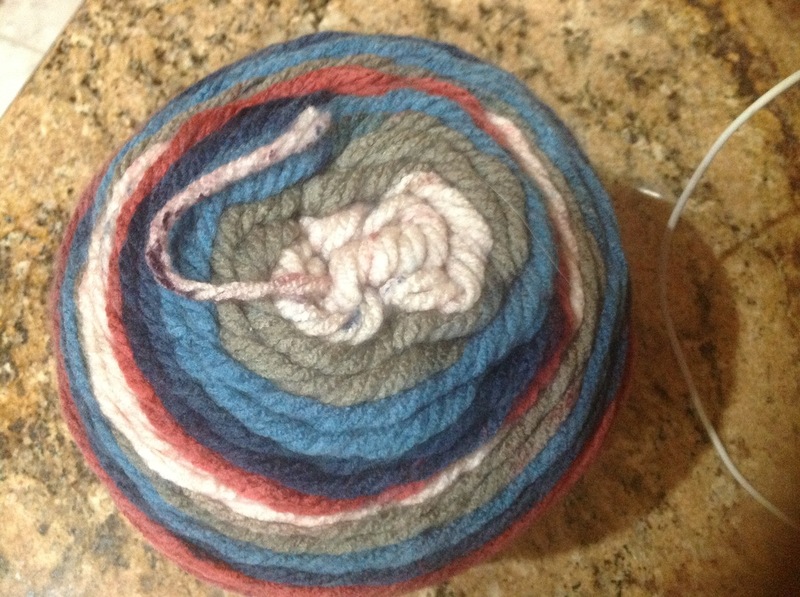 Darski, I have never seen knots tied in any of the color change cake style yarns before. How odd!